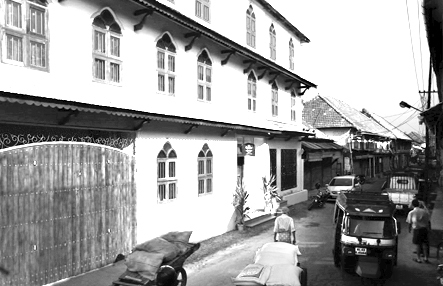 Nestled amidst the warm buzz of Mattancherry’s ancient bazaar, India’s First museum hotel sits ensconced in an 1877 granary that abuts the serene Cochin waterfront channel on one side and opens out onto the bazaar road on the other. The charming pitched roof, terracotta tiled structure was transformed from its earlier days as a granary and later a godown that stored ayurvedic herbs into a quaint museum hotel by the Ebrahim Brothers. Afthab and Arshad Ebrahim, hailing from the Singeri family of Kutchi Memon descent. The family migrated from Gujarat in the early 1800’s to Cochin and have shared valuable pieces of their family history at the hotel. Rare family photographs and artefacts showcase an era that has been frozen in time. The museum hall on the round floor houses a collection of sculptures, manuscripts, furniture and more that date back centuries and tell many a tale. Traditional Kutchi recipes handed down the generations also feature in the menu. The teeming bazaar outside the hotel has been trading fragrant spices, rice and pulses for centuries. The sourcing point for ancient traders from across the world the bazaar followed the barter system for centuries. Silk, pottery and medicinal herbs were boarded onto wooden ships to Europe. Ancient pitched roof buildings sits cheek by jowl while traders still conduct their business in rice, pulses, tea and spices. On the other side of the hotel lies the Mattancherry channel, the waterway that connects the ocean to the port and backwaters. On the opposite shore is Willingdon Island, built by Sir Robert Bristow, housing the port authority offices, wharfs and terminals for ships to berth when they call on Cochin Port. An 1877 Granary Which Later Became A Godown For Storing Ayurvedic Herbs, Has Now Been Converted Into The First Museum Hotel In Kochi, The Waterfront Granary By The Descendants Of A Kutchi Memon Family Named Singeri. The Reminiscence Of Their History Of Migration From The Land Of Kutch Is Evident On The Walls Of The Museum Hotel With Rare Pictures, Paintings, Artifacts And Historical Notes. The Guests At The Waterfront Granary Will Be Presented With A Once In A Lifetime Opportunity To Own A Part Of History By Buying Some Of The Relics On Sale. The Waterfront Granary Is A Marvel Among The Old Adjoined Buildings On The Kochi Bazar Road Of Mattancherry, Where Traders Of Spices, Rice And Pulses Etc. Thrive. The Exemplary Vision Of The Singeri Brothers, Afthab Ebrahim & Arshad Ebrahim And The Creativity Of Their Friend Varkey Joseph, An Interior Designer Triggered The Notion Of Kerala’s First Museum Hotel. Created From Near Ruins In A Time Span Of More Than 3 Years, The Waterfront Granary Is A Rare Gem Of Warm Hospitality And Elegant Architecture With An Amazing View And Exquisite Service. The Museum Hotel Boasts Of 16 Fascinating Rooms; 5 With The Old World Charm Of Godown Doors And High Wooden Ceilings; 3 Rooms With Water Front View; 3 Suite Rooms; 4 Rooms With A Bazar View And 1 Standard Room. The Lavish Use Of Colourful Athankudi Hand Made Tiles For The Flooring Adds To The Lure Of The Hotel. A Swimming Pool To Keep Fit, A Massage Room To Rejuvenate, A Library To Keep You Updated With The Past And The Present And An In House Cruise Boat To Ferry Guests For A Breathtaking View Of The Sunset Are Just Some Of The Attractions At The Waterfront Granary. The Hotel Has An Alluring Multi Cuisine Restaurant, The Traders Deck Perched On A Jetty Right Out In The Sea, Where Most Of The Passenger Cruise Ships Pass By And A First Of Its Kind Open Air Cafe On The Terrace, Asanjo Masalo Overlooking The Port And Serving Exclusive Traditional Kutchi Snacks And Drinks. A True Museum Hotel, The Waterfront Granary Also Has A Boutique Shop Where Guests Can Buy The Carpets, Souvenirs And Antiques. The Waterfront Granary Invites You To Enjoy Our Legendary Warmth And Hospitality And Be Our Privileged Guests While In Kochi. We Promise You A Pampered Experience You Will Never Want To Forget. This Is A Promise From The Host.